Ikea STROMBY with Gila Mirrored Privacy Film applied. Remember, this is a budget solution so there is some compromise in optical quality. It's good enough for a non essential decorative mirror, but probably not a primary bathroom mirror. Here you will need scotch tape, a squirt bottle, exacto knife, scissors, and a squeegy or scraper. There are lots of videos online with instructions too. Squeegy down the middle, and then from the middle out to the sides. Keep spraying and smoothing until all the air bubbles are gone. This frame simply facilitates holding the monitor, and attaching the mirror to your monitor. It will also serve as the enclosure for your Raspberry Pi. Start by finding a monitor, and ripping the bezel off by removing screws and jabbing a knife or paint scraper in the seam of the monitor. There may be some parts hanging free off the back of the monitor, which can be attached using electrical tape. Insulate the back of any menu buttons with electrical tape as well to prevent short circuiting. 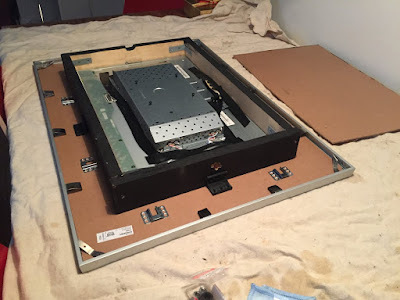 Once you have ripped the bezel off, it's time to build the frame. Use your most basic woodworking skills to size the wood frame, and then use the 90 angle brackets to attached the inner corners. Note, this will be hidden, so you can do an ugly job. I placed 4 small screws in the front and back corners to hold the monitor in place. I also painted my frame black for aesthetic reasons, however it's completely hidden by the frame overhang, so this is not necessary. Now we need to attach our mirror and monitor. I did this by cutting a hole in the rigid frame backing of my Ikea frame, and gorilla gluing some angle brackets to the backing to attach to the outside of the frame. Lining up monitor over frame backing with removed section(right). The hole in the frame backing was done using multiple passes of an exacto knife. Then I lay the monitor flat over the hole, centred everything, and used the all surface gorilla glue to fasten 4 angle brackets around each edge. I used 3d printed parts for this, but any 90 degree bracket with sufficient strength will work. 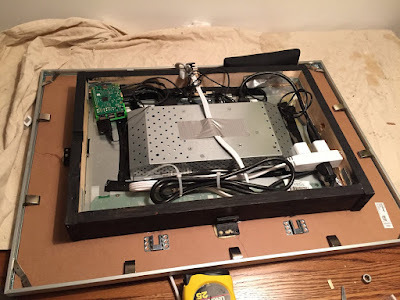 Once the glue has set, you simply screw the bracket into the monitor frame. Gorrilla glue setting on 90 degree angle bracket. It's up to you how to arrange your components. I punched some holes in the frame to run wires for my speaker and mic using a drill, and another trough for the power cable using a hand saw. So you've built your hardware! That's awesome, now it's time to get the raspberry pi running the MagicMirror and Alexa software. Of course the first step is just getting an operating system. I strongly recommend raspbian jessie, which already has a great install guide. You should also follow these steps to enable VNC Viewer, a remote desktop tool that allows to you acces your RPi desktop from any computer on the same network. This lets you work remotely once you've finished the initial setup, without plugging in a keyboard and mouse. This should show the default dashboard. To edit this, navigate to the MagicMirror/config/config.js file and add custom location, calenders, moldules, etc. If you've already got a computer on your wall, you may as well add some voice interaction. This can be done by installing and running Alexa on your raspberry pi as well. I covered this in a previous post. Alexa and MagicMirror will then run simultaneously on the same raspberry pi (at about 25% CPU). I am hoping to create some skills to change the magic mirror layout, add to do lists, etc, but for now it's just stock Alexa. Firstly, Thank you so much for taking the time to post a full detailed guide on how to do this. I would really like to do this project but I had a few question I was hoping you could answer. Would it be possible to do all the software setup (Raspberry Pi 3, and Alexa) on a mac? As i don't have access to Windows. Also, I have no prior experience coding but I'm pretty sure I can follow the guides fairly easily. Is the software setup too difficult or do you reckon I would be able to do it? Secondly, Do you think it would be possible to do this project with the following dimensions? about 80x100, as I'd like to have this mirror in my foyer as soon as you walk in. Lastly, Does the mirror look proper when it's turned off, as I'd like it to still be fully functional as mirror. 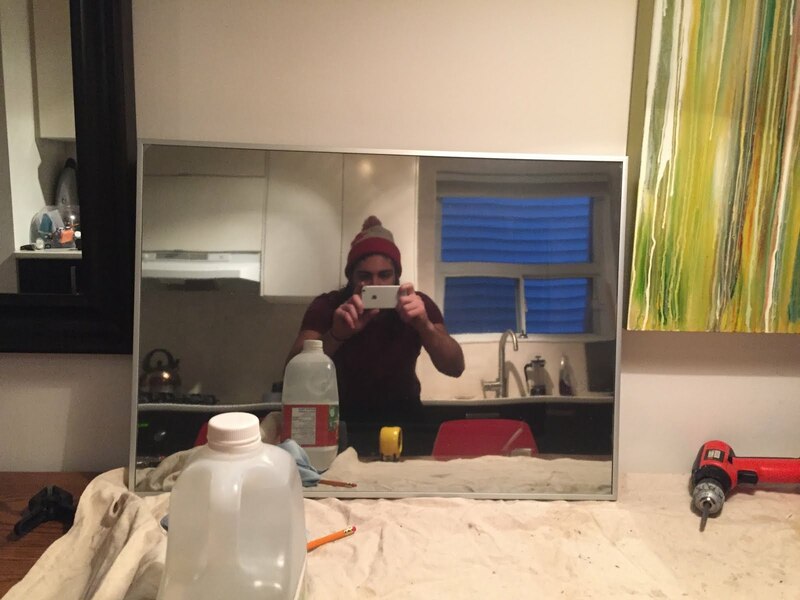 In your opinion, would the quality of the mirror be good enough to see as soon as you walk through the door? as you said it's probably not good enough as a primary mirror but in the photos and videos it seems to be pretty good quality. Keep the guides coming cyber omelette!! Hey unknown, I'm glad you liked the guide! Yes, this is very possible using a mac, and dimensions shouldn't be a problem so long as you can build it. Turned off the mirror looks great. I would suggest you buy some of the mirrored window film to test if it would be good enough for your foyer. Hi man! I loved your mirror, I think it's one of the best I've seen. Little question here, it's possible to command Alexa to play some music? I was wondering if I could use one of the USB ports of Raspberry for a flash drive, or make a folder in the SD card, and save music there for Alexa to play it... Do you think it's possible? If you could tell me at least a basis of how to do that, it would be awesome. Thanks man, and happy holidays.
. You can also us Amazon Music which gives you a small free storage space for around 100 songs. Getting music to play from the hard drive isn't as obvious though, and is something I'd also like to get working. I think you would have to write your own skill, but it shouldn't be too difficult. The raspberry pi is on as long as it's powered. You can shut it down using the "halt" or "shutdown" commands, and you turn it on by providing power. Mine stays on all the time for this. I'm not sure I understood the question properly, but hopefully that helps. I'm glad to hear this is getting you started! Hi, great looking mirror - quick question, using GILA mirrored film you mentioned the quality is lower, do you mean the quality of it as a mirror or the transparency of it, making the LCD not come through as bright? Also how does this work in low light, does the mirrored film lose the mirror effect or does it become clear in low light? Again great looking smartmirror and thanks for the write up! Hello, anyone have a good config file?? I have a couple questions about setting up the speaker/mic. I hope to skip the speaker installation part because the tv had speakers. However I'll need a microphone and I wonder I should use a webcam? maybe use skype on it later on? Do you recommend going this route? I don't know much about the pi yet so I wonder if the tv speakers will work at all? Hey Anonymous, sounds like a good use for the TV! I'd love to see a picture once you get it going... Using the speakers sounds like a great idea, all you need is the 3.5mm audio jack as an input. So depending on how you pass audio to the TV, it should be simple to run it out of the Pi audio jack. Webcam would be an interesting addition too... I'd suggest getting it running on its own with the Pi first. Then you can work on the configuration details through MagicMirror or scripts. Hey! I love this tutorial. As someone completely unaware of how to code or do any tech work, what would you say the difficulty level of this is? Is it a good learning project? I really want to get into more tech-savvy crafts and this one appeals to me the most. Thanks Matilda! I think you could probably get started with this project, but I would treat each step as it's own mini project. Just getting the raspberry pi setup would be the best place to start. Then you can try installing MagicMirror, and build the frame / mirror. I'd suggest adding Alexa last, as it's probably the hardest and least essential. Still pretty manageable though! Feel free to send questions my way as you work on it. Excellent guide. I see that you keep yours powered on all the time, but is it possible or is there an easy way to at least be able to power off the monitor? I assume the power button still works but it may just be hidden behind the mirror. I've just been thinking of possible solutions to conserve some energy. Hey Eric, I actually have a crontab script to turn mine off at night, and on again in the morning. I'm hoping to do a followup post with tips and tricks like this one. is it important to use res pi 3 or can i use 1/2? Being new to Raspberry Pi's, I have another question you may be able to answer - could you also use the same pi to host the adblocker pi-hole? To answer the previous comment.. not sure about pi 1/2, worth a shot if you've got one lying around. Eric, the only restriction will be CPU performance. Mine sits at about 50% with alexa and magic mirror going, I expect you could easily tack Pi-Hole on top of that. Give it a try! Thanks again for the info. I'm ordering the materials for mine and will hopefully get started on it next week! 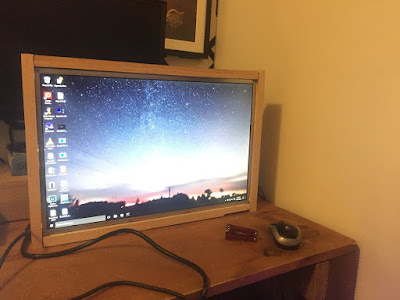 I already have a 22 in monitor that I don't use and I'm going to see if I can build one in a 16x20 shadow box frame. Is there a way to sync the calendar to the one on my phone? Hey Ryan, I think the first things to check are that you're giving sufficient voltage to the Pi, and that it isn't overheating. There are lots of tutorials if you google "get raspberry pi temperature". I would also make sure you followed the apt-get update and apt-get upgrade commands at the start of the Raspberry Pi config in this tutorial. Good luck, and let me know how that goes. I should mention that since I've left Alexa running (about 1 month), I have had one case of the app crashing for unknown reasons. If yours is freezing (becoming unresponsive), then these are likely not related. dont worry ive fixed it! If anyone else has this issue you need to download the alexa app to your phone, select your Pi and change your location. Hi Anonymous, plexiglass works well. It's what I built my prototype with. hey, I was wondering if there a way to sync the mirror with an android based calendar? Yes it absolutely can be synced with android calendar. Checkout the magicmirror2 pages on config files to see how. Hello I have a question I do not have a raspberry pi 3 at the moment but I found one of my old raspberry pi 2 will this still work with the pi 2? Hey Anonymous, I haven't tried it myself as I don't have a pi 2 - but I am pretty confident it will work just fine. There is a 100% chance you can get magic mirror going, but I'm not sure about Alexa voice assistant. Why not try getting the software running on what you have, and if it works you can proceed with the hardware mirror aspect? Let me know how it goes too please! Hi great work on your smart mirror. I was able to get Alexa to work on my magic mirror by following your thorough instructions. My question is how do I automatically run Alexa every time I turn on my Pi? Do you have the cron/script that you just execute? Care to share? Thanks! Hey, nice work Mr Teavhagun! Care to share a picture of the finished product? Unfortunately I still haven't solved that problem. I do run a "tvon" and "tvoff" script though to turn my monitor on and off, and then I leave the Pi running 24/7. Terminal Window 3: to run the wake word engine which allows you to start an interaction using the phrase "Alexa". Can this be combine in one cron/batch file script so whenever I reboot by Pi, it will automatically launch Alexa? The trouble is the 2nd command requires user interaction in a web browser, so automatically running them doesn't successfully start Alexa. Maybe you could use an automated GUI tool to get around it, but I think a new App is required that authorizes by device. Thanks for your response. Will do some more research. Hey Carter, a couple questions for you. Are you using the Raspbian Jessie distro? Does the whole system lock up, or just the script (will it respond to ctrl-c or ctrl-z)? Any output before it freezes? Hi Ben, thanks for getting back to me. I've managed to get it loaded. After I started to run the programme I would hit a pager page. This I now know gives you the opportunity to not install certain parts of the programme should you wish. When you scroll to the bottom of the page you get the option to "q to quit". After that the programme carries on loading until it completed. In the MagicMirror directory there is already a sample config that can be modified. If you run "npm start" from the MagicMirror directory, what happens? Ben Eagen .. It starts magic mirror and alexa is running in background fine but i was looking for something like sine wave that is displayed on Magicmirror when you say wakeword. That doesn't show up. How did you hang the magic mirror? Hey Mohammed, I just found two wall studs and put screws in the wall sticking out about 1cm. Then I just placed the frame onto the screws, and the heads bit into the soft wood. I would probably recommend buying some framing wire though, as if these bent over time it could be bad! Glad to hear you're working on one of your own! If you have two pis, I can't see any reason to squeeze these both onto the same device. I checked again though and my CPU usage sort of bounces between 25-35%, though that's between 4 cores. If I run "top -o %CPU" I see wakewordagent taking 100% (one core), and all other processes are less than 10%. My only explanations for instability would be high enclosure temperatures, or the background noise increasing load on wakewordagent somehow. If you've got two though, may as well use 'em!. I'd be interested to see how they look arranged in your enclosure together too. Fire over some links in these comments if you feel like sharing! As you can see, almost al 4 cores. Backnoise doesnt seem to be the problem as turning off the mic don't make any difference. Bob, wow you weren't kidding about high cpu usage! Do you get the same results using kitt_ai (even if it crashes)? Feel free to pass on any other clues you may uncover if you want a second mind on it. Kitt_ai is showning me i bitt less usage, but still around 300%. This is great, I got through setting everything up and Alexa worked first try, but then when I tried again, it didn't recognize me saying "Alexa." Can anybody help as to why this stopped working? Hey Colton, going to need more info than that. What's the problem? Time zone for your pi, or Alexa? Should just be an option in the settings either way. Hey, Shachar Zuk I'm going to need a lot more info than that. Which script are you running? Can you include your exact input and output commands? Hi Ben, I love your guide and will be attempting this within these next couple weeks as a gift for someone. I just had a couple questions. 1. Where did you place the speaker and microphone so that you don't have to yell for it to hear you? 2. Do you have a guide or is there an easy way to integrate spotify and/or hue light commands. Since it has the speaker and mic i wanted to take full advantage of these features. Thanks! So sorry to bug you again, but in your other post you recommended the (e)scape Platinum (on sale in local Compute Canada) speaker. Which one should i get as you recommended two different ones? Also in the other you said "Mic has to be USB", however the mic you chose in both are connected via 3.5mm jack. Hi Shane, glad you like the guide! 1. I glued the speaker and microphone to the bottom of the wooden frame, so outside the main enclosure. 2. I am now using hue and it works right out of the box from the Hue instructions included. Very simple. I believe spotify works too, but I don't use it so I can't verify that for you. 3. You should be my proof reader :-) What I meant is you need a usb sound card to receive the mic. So I include a USB soundcard in the item list, and the mic plugs in to that. I will edit that now to clarify. Awesome guide, I was wondering how far the mic can pick up your voice from? Hey Francis, it's good to about 15 feet I'd say. Bedroom and living room are small and beside each other, picks up fine in both. Firstly I would like to thank you for making this guide. I just finished my project and am very excited about it. I was wondering if you, or anyone else, had been able to link their Spotify to Alexa. I have tried linking my account to Alexa and it says it is "unsupported by this app" when I try to link them. Has anyone else encountered this, or gotten Alexa to play music from Spotify? Thank you in advance. Hey anonymous, really glad to hear your build worked out! I'm sorry to say I don't use spotify, so I haven't tried getting the app running myself. Hopefully someone else here can chime in, the reddit amazonecho community might be able to help too (https://www.reddit.com/r/amazonecho/). i got this error "line with format PCM_SIGNED 16000.0 Hz, 16 bit, mono, 2 bytes/frame, little-endian not supported"
Hi great project, I was thinking to give this a try... do you think it could work with a Pi zero? Do you think this display can have a less thick frame? It seems that this one is thinner than the one you used. You can definitely go thinner, make sure to leave room for some airflow though - monitors can get pretty hot! Did you add face recognition in your mirror? If yes, which camera did you use? Hi Ben... Can you please provide instructions on how you got the film to stick onto the mirror with no bubbles. I got the exact same frame from ikea, and ordered the exact same gila film. I spray it and then use a squeegee but it seems to always bubble after a couple hours. Did you let it dry standing up or laying flat? did you squeegee every 10 mins? etc. I've tried 3 times so far and keep wasting the film. Please help. There are lots of resources online if you search "applying Gila film" which will probably be more useful than my testimonial. If you're getting bubbles it means there is dirt or dust on there though, so I'd recommend a microfiber lint free cloth to really wipe down the whole surface. Hi Ben, just an FYI that i saw a video online which used a credit card instead of a squeegee and it worked for me... much much better. I guess you shouldn't buy your squeegee from Dollarama. Thanks for your help! Next is implementing Alexa. Hopefully i don't end up having to bother you again! Good tip Shane! I would have expected a credit card to scratch the film, but I guess it doesn't. Good luck on implementing Alexa, and don't worry about bothering me if you do run in to trouble. I have to say this magic mirror build is by far the best and easiest to follow. I do have somes questions though. Have you did any updates to your magic mirror since your build, did you over-clock your Rpi, and do you think 3mm thick acrylic two way mirror would work? Hey, thanks Nick! I tried to keep it as simple as possible on account of not being very handy. I would expect 3mm two way acrylic to work great, I think many have succeeded with this strategy. No overclocking on the Pi, and no modifications other than a couple more drilled holes for air flow in the frame. I have to say this is an excellent guide and for someone who bought a pi 3 one day one and followed this guide on day two, to successfully accomplish what I set out to do (baring in mind I've never coded or done any advanced IT) that is amazing! Hi Anonymous, so glad to hear it worked smoothly for you! For the Alexa bootup, I just threw the 3 commands at the bottom of this post: http://www.cyber-omelette.com/2016/11/alexa-pi.html into three scripts. So when I boot up, I run ./alexa1.sh in one terminal, ./alexa2.sh in another terminal, wait for authorization, then run ./alexa3.sh in another terminal. Finally I run ./mirror.sh to start my mirror script, or have it setup using cronjob to run automatically. Did I understand the question properly? Hopefully that helps. Hi Ben, Great video. I went ahead and purchased the suggested materials from Amazon but it looks like I won't be able to order the STROMBY frame here in the US from what I can tell. Do you have any alternative suggestions that might also work? Does this contain the mirror component that I need? Hey Vyse8, there is nothing special about the STROMBY really, except it has a sturdy glass surface and the right dimensions. As long as the frame is bigger than your monitor you should be just fine. Note that you'll also have to be able to cut whatever the backing material is... usually some sort of compressed particle board, but sometimes these are plastic. 1. 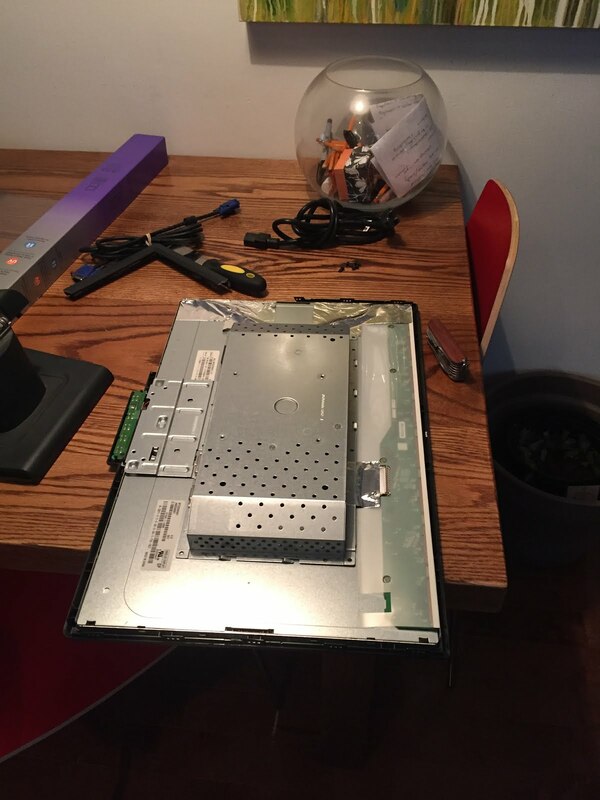 What did you mean by "I placed 4 small screws in the front and back corners to hold the monitor in place. " 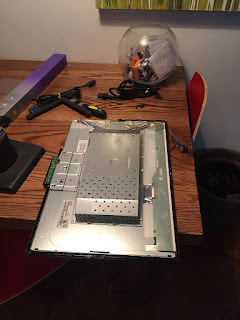 how did you place the screws to hold the monitor in place? I didn't see any screws anywhere in the photos above? 2. How did you mount the mirror to the wall? Did you use a monitor mount, or mount it by the frame? Also, please upload the link to whatever you used to mount it. Thank You! I appreciate all your help. I like the Stromby, in my opinion the monitor does not look to small, but it is centered instead of at the edge as you can see in the photos and videos. You can choose your own preference here of course, and I think both will look just fine. Thanks Ben, I follow u on Facebook And utube as well, so i'm really waiting for more videos about this project, Keep going. Sorry Ben, any answer to my previous comment above? I'm hoping to have this done for next week (family members bday present). Not sure the best way to mount it without everything possibly falling apart. I mounted it by the frame temporarily, and then added some hanging hooks like these: https://www.amazon.ca/uxcell-D-Rings-Picture-Hanging-Hangers/dp/B01M15TEGZ/ref=sr_1_12?ie=UTF8&qid=1494850493&sr=8-12&keywords=picture+hanging+hooks. As for the little screws at the corners of the monitor, they stop the it from sliding forward and backwards in the wooden case. Not really sure how else to describe it. The purpose is so your monitor doesn't move - if it's stuck in place using any method, then you're all set. Hi Ben, many thanks for the reply that is perfect, although not sure what 'cronjob' is but nothing a Google cannot fix, thanks again and keep up the good work! How can you autorun these scripts at startup? Tried rc.local but its not really working. Anonymous - unfortunately I haven't solved the autorun on startup problem yet due to the user input required from the second script (authentication with amazon). So I start it up manually and leave it running. I've been meaning to come back to this though, as it would be way better to start automatically! Using VNC viewer to remote into the mirror makes running the scripts a lot easier at least. (Make sure to put #!/bin/bash at the top of every file and filename ends with ".sh"
If you need any clarification, let me know. GL everyone! Sorry, i forgot to add that you must right click on each file, click properties, then permissions, and that "Execute" must be set to "anyone". This goes for every file you create. This failure might be due to the use of legacy binary "node"
Did you follow the steps to update electron and nodejs? $>sudo npm install electron "
i got those problems. how do i fix this? can anyone please provide detail guide to configure pi with usb sound card? I was wondering if you could help me in terms of ensuring that the companion app starts minimised. computer monitor you mean??? monitor glass?? Great job and so far I have monitor and ready to go with other stuffs. $> curl -sL https://raw.githubusercontent.com/MichMich/MagicMirror/master/installers/raspberry.sh | bash. How can i fix it? E: The repository 'http://archive.raspberrypi.org/debian stretch Release' does no longer have a Release file. Sorry unknown, that looks like a problem with the MagicMirror auto install script. 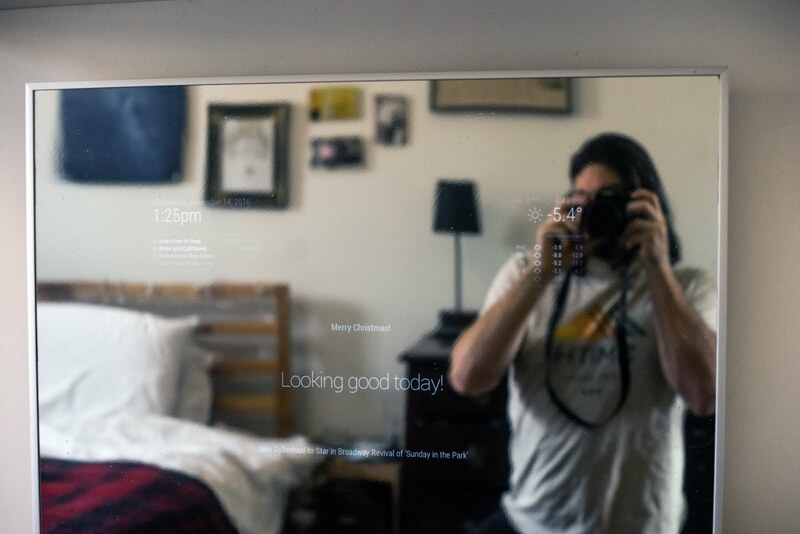 You'd probably have more luck over on their forum https://github.com/MichMich/MagicMirror. Hey Ben, i would like to connect my alexa with my mirror, is that even possible? I can't use a script to run alexa on the pi. Do you have any ideas how to implement this? Sara and Jana, I'm confused about what you're trying to do and what your problem is. All of these things are definitely possible - that's what this blog post is about! Note, the "run a script on the pi" aspect is only for further non-standard Alexa customization. I liked this project alot. Thanks for being a inspiration. Me and my friends are using your idea as our major project. We did a slight change and instead of using alexa we are using google assistant. Do you think it will run the same way as yours do? Hey Kartik, sounds like fun. Hope it works out for you! I've never used Google Assistant on a raspberry pi, so you'll be in uncharted waters there. Sounds like others have though, so it shouldn't be too hard. My boyfriend has recently become OBSESSED with computers and smart (enter accessory here). I like to have some sort of awareness of his hobbies and tend to try things out that are similar. I figured I'd start off with a project and found this on the web. You are the first person to express the step by step process in a generally understandable and well flowing manner! Congrats, you get a sub! Thanks Alicia! Really glad you found it understandable. 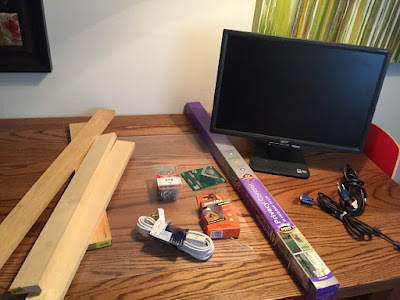 I think the fun of DIY is that you have to have some knowledge about all the components to get a working project, so I try to just tell the story of how I learned that stuff. I bought the sound card from the link in the tutorial, but when I plug it in, it doesn't work for output or input. When I plug my speaker into the 3.5mm jack on the pi my speaker works fine, but it doesn't work when it is connected to the sound card. I'd rather not buy a usb mic because I already have a mic like the one you used. Any ideas as to why the sound card isn't working? Sorry Keaton but it sounds like your sound card is broken or not setup right. You can use the output on the Pi just fine, but you'll need the soundcard for your input. after cloning MagicMirror on my pi and completely configuring it. where do i need to install or clone alexa in the magicMirror module folder or in pi's home ??? Do you apply the gila window mirror film directly to the monitor or to a piece of glass. Then put the glass with the gila window mirror film right in front of the monitor? Hey Ben, awesome guide. Is there anyway to hide the screen and display the screen using voice assistant or something else? I want to gift this and make it as hands free as possible. I'll have the pi running 24/7, but don't want Alexa taking up the entire mirror. Thanks in advance! i wish to make a magic mirror and make it more interactive by adding a touch in addition to alexa voice recog. I have never used pi (will be learning it in my summer vacations). but before i go and buy out the components i need to ask what extra components or alternatives will I require? Please do help. hi, I would like to do this as a class project, but i dont know if, nowadays, in 2019, its update or if it has change something in the process of installing the software.